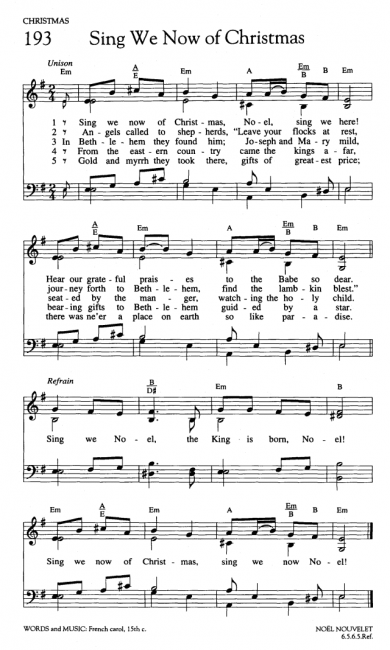 Known in French as “Noël nouvelet” and in English by both “Sing We Now of Christmas” and “Sing We a New Noel,” this is available only in the French hymnbook. The English translation is fairly standard across other denominations’ hymnbooks in which it is included. I love the energy, the motion, and the minor tonality of this carol. If not done respectfully, it could get a little out of hand for a sacrament meeting. But done right, this could be a wonderful, worshipful addition to your Christmas Program. I recommend Fred Prentice’s arrangement. There are two versions, both SATB, one with a harp/piano part and the other is a cappella. The video below is of the a cappella version. At under two minutes, it goes by quick! So, I was wondering if anyone knew if there is a mistake in the French hymn book. All the versions ive seen are 1121 (for repeats of phrases), but the hymn book is 11221 and the second 2 phrase is not the same as the first 2 phrase and frankly it sounds funny when I play it as written. I don’t know if I’m explaining this well at all, but I can’t find any other copy of the song that is similar to the lds hymn book.